A recent publication by OMRS entitled “By Order of her Majesty” co-authored by OMSA presenter and blogger William Pickering, deals at length with the manufacture and official naming of Crimea medals which at the time, presented a huge challenge for the Royal Mint and its subcontractors because of the sheer numbers involved and the pressure brought by the Sovereign to have the medals issued so quickly. I hadn’t paid much attention to the Azoff clasp given the fact that although my interests lay in naval medals, officially named Crimea medals to the Navy represented a small portion of the number issued and of those, an exceedingly small number of medals had this elusive clasp and while this new book provides detail on officially named medals which hitherto had been considered privately engraved, the fact remains that for medal collectors, the legacy is a vast number of unnamed Crimea medals which are thus unattributable. In the 1996 book The Azoff Campaign by Peter Duckers and Neil Mitchell, the authors state that they hope the publication of their roll will help establish entitlement to the clasp since it became clear to them that many medals bearing this clasp that appeared in auction catalogues and dealer’s lists over the last hundred years, were to men not entitled to the clasp. After acquiring a pair of named medals to a man who earned the Azoff clasp while serving as the Coxwain of the 2nd launch of Agamemnon, I found myself much more interested in this important part of the Crimean war as the allies dealt with the importance of this inland Sea to the transportation of troops and supplies for the Russian war effort in the peninsula. Acquiring the medal is usually what it takes before I expand my knowledge (and what it takes before I write a brief blog). 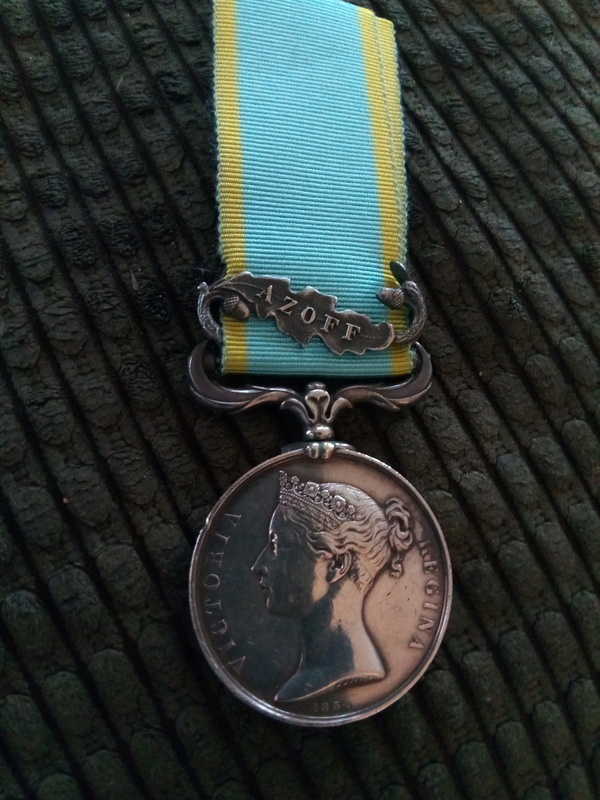 The operations in the Sea of Azoff took place over a period of 11 months and are outside the scope of this blog but some of the raids which resulted in 9 Victoria Crosses can help us understand that for many, this was indeed a “hard earned” clasp. Of the approximately 20,000 medals issued to the RN and RM, roughly 10% of the seamen and marines were entitled to the Azoff clasp. The vast majority of which (1,700) involved men from the Steam Ships and Steam Gun-Boats which entered this inland sea as part of the Light Squadron. The remaining 15% or so were awarded to men who took part in the Azoff campaign as part of the Ship’s company of a number of Line of Battle Ships and in particular, men from the launches employed in the attack of Taranrog on June 3, 1855. In his book Naval Medals 1793-1856, Captain Douglas-Morris pays particular attention to the medals to men from Agamemnon including those men who served in the two launches led by Lt. Gaussen and Lt. Young. He singles this ship out amongst the others given the fact that large numbers of men from Agamemnon received a “depot impressed” medal and given the fact that none of the 4 ships who received officially impressed medals (London, Niger, Rodney and Wasp) entered the Sea of Azoff for participation in these “commando” style raids, he concluded that a medal named to Agamemnon offered the best chance of obtaining a “demi-officially named medal” with the Azoff clasp. Agamemnon aside, (and there were less than 90 of them entitled to this clasp) there are opportunities for the collector to obtain an impressed medal to a man lent from RODNEY (17) WASP (2) or NIGER (1) with the clasp. Although this new book brings to light additional information on “officially engraved” medals, I believe that none of the medals in question have the Azoff clasp. With a large number of Crimea medals issued and a preponderance of unnamed medals at that, I believe that this campaign medal more than many others may have a higher likelihood of being melted down over the years. This is borne out somewhat by the very low number of “extant” medals recorded. When his book was published 30 years ago, Douglas-Morris was able to determine a survival rate of officially named Crimea medals of less that 8%. With the data now available to us in a more connected collecting community, we can see that this figure was significantly under estimated and more likely the survival rate is closer to 15%. Even with a projected survival rate of double the original estimate, when extrapolated, the number of surviving, officially named medals with this clasp can’t be much more than 20. Of course, an unnamed medal verified on the roll and included in a group with other named medals brings about a level of attribution which is comforting to many collectors, an officially impressed or depot impressed medal tends to add that little bit extra comfort. Thank you for your interesting comments on the Azoff clasp. 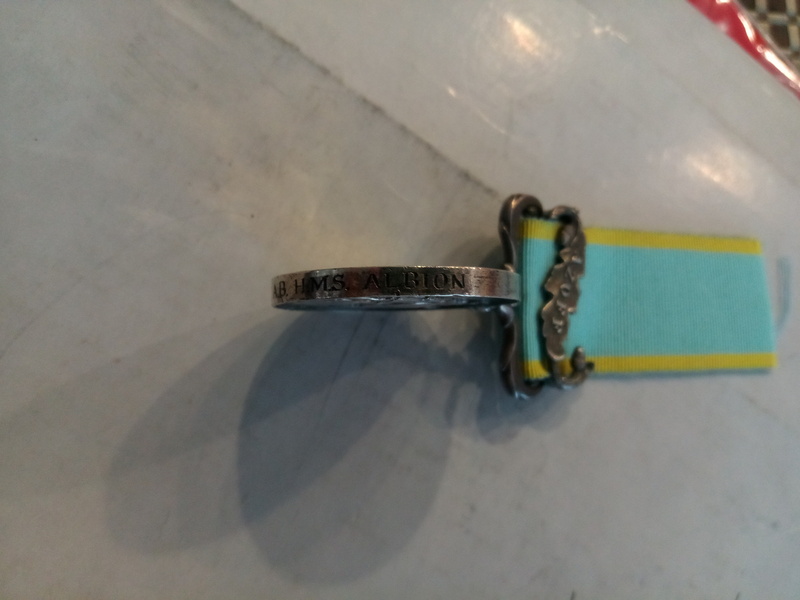 I am currently trying to track down my 5x great grandfathers Crimea medal with Azoff clasp. He was Francis Coucher and served on HMS Algiers. He is listed in the book you mention. My great grandfather sold this medal along with others in order to buy a camera! However, we do still have a daguerreotype photograph of him in uniform, a Russian musket he brought back and his initialed sea chest. I have a Crime Medal impressed to a seamen F Wilson HMS Albion able seamen Azoff clasp. I got it years ago. He’s on the rolls for the Navy. I think the naming on your medal which is typical for Albion is officially engraved. I am doubtful however as to his entitlement for the Azoff clasp. Its quite possible that he earned it serving on another ship but I don’t see his name on the Azoff roll. Emailed from Royal Naval Museum says he’s Crimea entitled and rolls are not 100 percent especially for the Crimean War. If impressed he’s entitled was told. Ethan, the medal you showed is not with impressed naming, but engraved.